The human body is a marvellous system, with completely integrated load-bearing and power transmission systems that are both self-replicating and adaptable to changes in environment, work rates and power requirements. Engineers, biologists and surgeons face a substantial task when they attempt to design procedures, components and systems to replace tissue damaged beyond repair by disease or trauma. This makes the correct material selection for prostheses and other devices used in implant surgery a critical matter and a major challenge. When the Nottingham Shoulder and Elbow Unit decided to replace actor Tim Baggaley’s collar bone last year, which was shattered beyond effective repair in a motorcycle accident, a titanium replacement was designed by Biomet Merck so that it could be linked to other bones with artificial ligaments prepared by Ellis Developments, Pearsall and Surgicraft. The replacement of the collarbone, a world first for the team, was entirely successful, and the problems of scuffing or galling were overcome by coating the implant with Tecvac titanium nitride (TiN). Replicating the performance of any joint in the human body is difficult for conventional engineering and materials technologists, and although ceramics, plastics and cell replication techniques may well provide solutions in the next three decades, the reliable metal options for load-bearing structural implants are still stainless steels, various chrome alloys and titanium. All of these can be improved by coating the implant or device, a process that can improve wear, lubricity and biocompatibility, and avoid reactions with bodily fluids and tissue. Unlike heavy materials such as chrome alloys, titanium, with its much lower density and high levels of biocompatibility, is a reliable material for structural implants, particularly if significant areas of bone need replacing. However, using titanium alloy as the principal medical application material (Ti6Al4V) has a major disadvantage. In all areas where there is load bearing and articulation, mating titanium alloy surfaces can gall or scuff against each other to produce increased wear rates. By coating Tim Baggaley’s collar bone implant with titanium nitride, applied by Tecvac: Limited using physical vapour deposition (PVD), a very hard (2000 HV), but smooth, low friction surface was produced, enabling all the connected prosthetic components to move freely and easily in concert, without any artificial lubrication. Figure 1. Titanium nitride coated titanium collar bone implant. The collar bone was designed using Mimics from Materialise, a unique piece of software that allowed Biomet to produce a mirror image of Tim Baggaley's healthy collar bone by importing data from CT scans into a CAE program to machine a replacement from a solid bar of titanium alloy (Ti6Al4V). The titanium nitride coating is produced by evaporating high purity titanium using an electron beam and combining it with nitrogen in a vacuum chamber to produce a fine, molecular scale vapour. This is deposited on the full surface of the metal collar bone to give an even, gold-coloured, high integrity layer between one and three microns thick. Titanium solves three problems in implant design. Firstly, it gives high levels of biocompatibility, secondly it allows significant improvements in joint lifetime, and thirdly it allows the lightness and flexibility of titanium to be fully exploited for the patient’s benefit. Some implants also use chromium nitride, but titanium nitride has a well-documented history, which leads many surgeons to specify it as their preferred material. Titanium and high-density polyethylene offer highly biocompatible solutions, using elements that fit well with the chemistry of the human body. 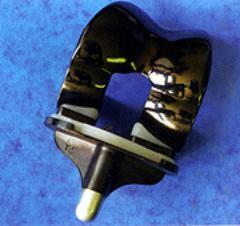 Nevertheless, wear still limits the lifetime of the implant or medical device. To further enhance the performance of these materials, researchers have investigated both ion implantation of metal and plastic surfaces, and the use of diamond‑like carbon (DLC) coatings. DLC appears to have high levels of biocompatibility, and its extreme hardness of 4,500 HV offers extended operational lives to both hip and knee prostheses with more than two decades of successful applications in France. Figure 2. Knee prosthesis featuring diamond-like carbon coating. Many of these materials considerations apply throughout all areas of invasive surgery and therapeutic investigation techniques. Of course, in any type of invasive activity, infection control is paramount, especially since bacteria and viruses mutate rapidly to become resistant to post-operative antibiotics and other infection control management techniques. This means that all materials used in surgery must be capable of sterilisation using tried and trusted steam or chemical autoclaves, fluid-based antiseptics or gamma irradiation. Here, coatings can make a major protective contribution, particularly in relation to surgeons’ tools and other equipment, which may be within the body for some time, or may be sterilised many times. While prostheses and implants provide considerable engineering challenges, all invasive probing devices must consider surface engineering issues, whether they are cameras to investigate the digestive system, electrodes to investigate or record brain function, or long-term equipment / tissue connections used for drug / fluid delivery or transfusions. Here the critical issues are corrosion, biocompatibility, the growing tendency in the population for allergic reactions, and the body’s sensitivity to certain metals, notably nickel. By coating the implant or medical device with TiN, the metal’s surface is sealed, which reduces staining and corrosion, and avoids allergic reactions. The degree of biocompatibility offered by TiN has a potential advantage in cardiothoracic surgery, where the long-term implantation of pacemakers, stents and other devices to support arterial function can lead to rejection problems and scar tissue formation (not to mention the corrosive effect of bodily fluids on the metallic parts themselves). While staining is mainly a cosmetic issue, prevention is essential when it comes to dental work. Here, ceramic thin films are providing a big advantage. Work being carried out at the Advanced Materials Research institute at the University of Northumbria is exploring a variety of ceramic film coatings using different combinations of TiN and other ceramic films in a specially-built Tecvac ECU700 PVD machine to provide multiple layer coatings to overcome specific problems at the human tissue / metal surface. The demand for application of implant and prosthetic surgery is steadily increasing, particularly as the average age of the world’s population continues to rise. The materials challenges continue to grow in direct proportion, and consequently coating technologies are developing rapidly At the same time budgets come under increasing pressure, so everyone in materials science is likely to see even more challenges for innovative solutions to ensure that implant and prosthetic surgery is reliable, effective, comfortable and, by reducing costs, becomes available for more people. Many other coatings are currently under consideration. Already plasma-sprayed hydroxyapatite, which mimics bone formulation and structure has shown great benefits in encouraging bone growth around implants. Diamond-like carbons, not yet in widespread use in the UK, also offer significant potential, particularly because of their extreme hardness, wear resistance and potential application to polymers. Some technologists claim a wear benefit of 10 times better than titanium nitride, but the complexity of the materials choice in the biomedical world means that wear resistance alone is not enough. A myriad factors have to be rigorously evaluated by multidisciplinary teams to ensure that in the end the patient has the most comfortable, safe and effective solution. Source: Materials World, Vol. 12, No. 2, pp. 31-32, February 2004.